Hi guys I’ve been stuck here for several days trying to find a solution by myself but I still don’t get what I have to do. In Computer Science a queue is an abstract Data Structure where items are kept in order. New items can be added at the back of the queue and old items are taken off from the front of the queue.Write a function nextInLine which takes an array (arr) and a number (item) as arguments. Add the number to the end of the array, then remove the first element of array. The nextInLine function should then return the element that was removed. the nextInLine() function should be modified so that the arr parameter (which is an array) is treated as a queue. the arr parameter needs to be modified so that the item parameter to the function is added to the end of arr, and the first element of arr is removed. The element that is removed from arr should be returned from the function. Many solutions to this exercise use array functions - you can google “mdn array shift” and “mdn array push” - the shift function can be used to remove the first element from arr, which in turn can be used as a return value in the nextInLine function. The push function can be used to add an element to the end of an array. One more tip: add the item element to the end of the array arr before removing the first element from the array arr. @eeflores is correct, but let’s see if I can put it more simply. console.log(bob) will print [1, 2, 3, 4, 5, 6] to the console. console.log(bob) will print [2, 3, 4, 5] to the console. so for this challenge, you need to combine those two methods. eeflores, ChadKreutzer thanks for you quick reply. This is what I’ve been doing with your help but still, what am I missing ? Second. 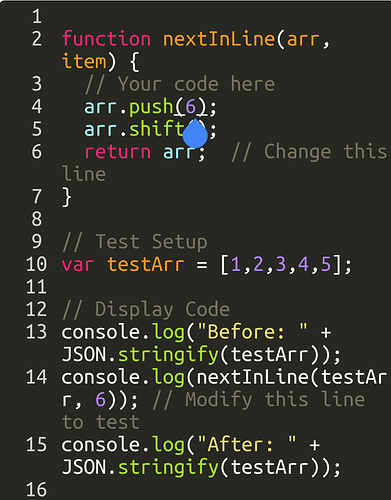 Since item is what is passed into your function along with arr, you can operate directly on it like you can with arr. Third, what you are wanting to return is not item, but the results of arr.shift(). Hopefully that helps. Let us know if you are still stuck. Let me see if I can blow your mind: you only need two lines to solve this challenge. Remember, we don’t care about the value push() returns, all we care about is what it does to arr. Conversely, we don’t care about what shift() does to arr, all we care about is the value it returns. Okay. So Array.push(x) and Array.shift() are what I call dual wielding methods. they return a value on the “left hand” : ( var y = Array.push(x) ) and since they change the object they are working on (the Array), they also return something on the “right hand”: (the new value of Array) In this challenge, we are going to take advantage of that property. we don’t care about the new length of arr, but we do want to use the changed value of arr. that’s why we don’t bother assigning a variable here. so now we have our shiny new arr. What we want to get is the value at the 0 index (arr) but we can’t just say return arr because the validator is going to check to make sure that the length of arr decreases by one. 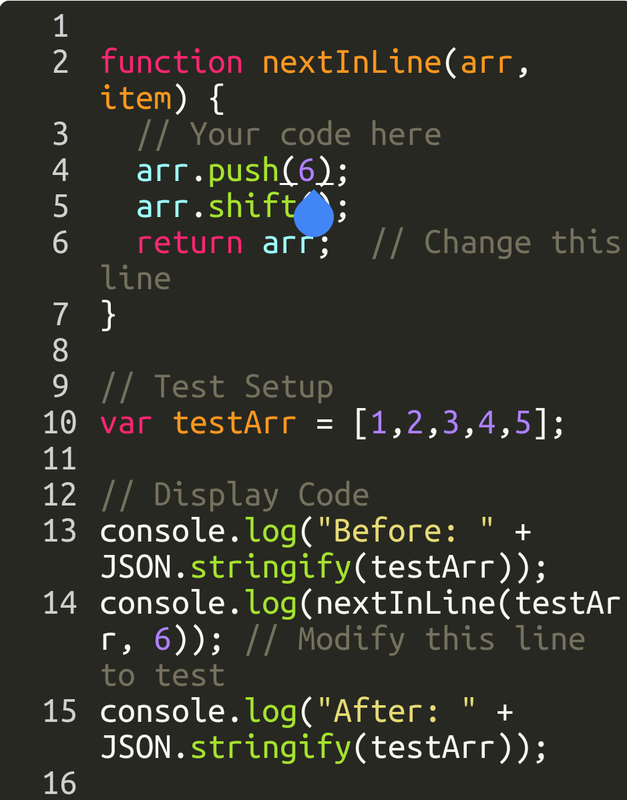 now since what we want is the left hand result, we could do a variable assignment then return that, or we can just return it directly: return arr.shift(). That’s a whole lot of words for a two line function, but hopefully I was able to make it clear what is going on. ChadKreutzer thank you very much for your help and I did what you told me. Technically return is a statement. The things that end in “()” are functions (or methods) if you look at the top of all the challenges, what you are creating are functions. In this case, it’s the function nextInLine(). Functions are like little boxes that do something. Remember my hand analogy? A return statement is what tells a function to deliver a left hand result: you are telling it to “return” the value of whatever is directly to its right out of the function. It’s like where the copies come out on a copier. It’s essentially saying stop what you are doing and give that to me. In fact, in the arr.push(item) function, the new length of arr that you get on the left hand is the result of a return this.length statement. ChadKreutzer thank you with your help I’ve been understanding better what “return” statement is for. Maybe it’s because I don’t fully understand the purpose of return? With return, does it also always execute what you tell it to give? right now, this function is an empty box. it doesn’t do anything. but lets put something inside it, ok? now bob is doing something. It is assigning the variable foo the value of 3*2, but if you called this function, it would still do nothing. We need some way to get the value of foo out of bob. that’s where return comes in. Now we’re cooking with mesquite! Think of those parentheses after the function name as the opening at the top of the box: whatever you put there is going to go inside. The function will do its magic, and then with the return statement, it spits back out whatever you want it to spit out. will give you 6. But remember, without the return, you will just be sending the 2 in to languish forever. There are other ways around this structure, but they are usually code smell, and you want to avoid them when possible. Hopefully that will clear up any misunderstanding you have of the return statement. a value of '2' instead of the '1' that the challenge is expecting. No problem. I enjoy helping people. I’ve read through this whole thread and still don’t have working code. I must be missing something in the translation of your instructions. Could you please take a look at what I’ve got and help me understand what I’m doing wrong? It’s the extra arr.shift(). Each time you call that, it does its thing. EDIT: I got it to work. Interesting, not sure why my previous code is so wrong, though. Is it because in the previous code my “return arr” is returning the array inside the function…so it’s getting returned twice when the function is called? Anyone care to explain the difference in meaning between previous and current?